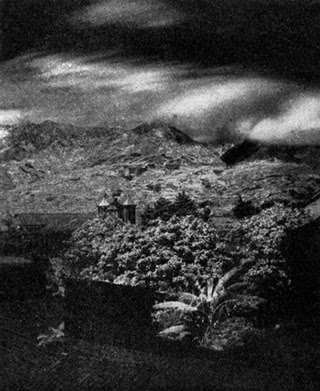 In a letter to the Times in 1932, CEK Mees mentioned long-distance infrared photographs of mountains, taken in Costa Rica 'in 1915 or 16' by Gustave Michaud and José Fidel Tristán, which were published in Scientific American. Researching to find this paper turned up a few interesting items by these two scientists. The paper to which Mees referred turned out to have been in the December 26th 1914 edition of Scientific American and called Air Transparency for Infra-Red Rays. It did include views of mountains taken from San José in Costa Rica, demonstrating the haze-penetrating ability of near infrared. The plates used were spectrum plates by Wratten and Wainwright. These plates were produced sensitised to 800 nm but by using alizarin blue S the sensitivity was increased not only beyond 800 but also in terms of reducing exposure times to as short as two minutes at f8. One of those photographs is reproduced below. It seems (assuming I am not confusing people with the same name) that Michaud was an American or Swiss (references differ) who had been in Costa Rica at the end of the 19th century working on surveying and mapping. If he was a student of Wood's then he presumably went (back?) to the USA to Johns Hopkins sometime between 1901 ... when Wood arrived there ... and 1912 ... when the La Nature paper was published, returning to Costa Rica and teaming up with Tristán. Tristán was considered an 'outstanding' Costa Rican naturalist, and published the first list of native insects (in 1897) with a species of flower fly named after him (ocyptamus tristani). I'll come back to the subject of insects in a later post but this duo collaborated during the decade on a number of applications of both infrared and ultraviolet photography. Thus far these are the only people other than Wood and Mees of whom I have found evidence of work in infrared in the early years of the 20th century.